The school opened with just three classrooms and has grown to over twenty fully equipped rooms. The Whenuapai School library is situated behind the astro turf court and is open daily from 8.30am to 3.00pm Monday to Friday. Our library is well stocked and inviting, and we are fortunate enough to be able to keep adding fabulous new books regularly throughout each year. Each class is scheduled to visit the library once each week and books are loaned for one week periods, however, books may be renewed. After a book has been overdue for one month, we seek assistance from parents/caregivers to help locate the book or to purchase a replacement. The library always has children’s artworks on show and parents are more than welcome to visit and admire them. Our annual Scholastic Book Fairs are always popular, and generate lots of income from sales to enable us to purchase more library books and school resources. 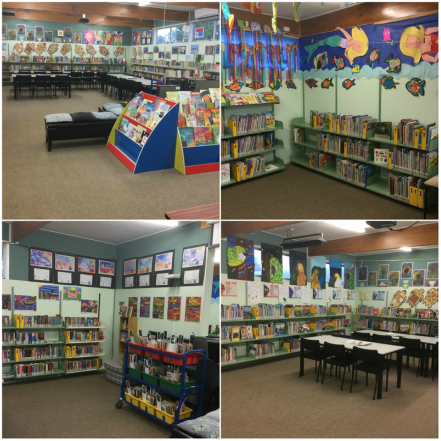 Our library is always themed for book fairs and looks stunning with the aid of our talented children’s art. The library manager is Claire Brain, please do pop in, or e-mail library@whenuapai.school.nz if you have any queries or concerns. The school has two large marked hard surface areas which serve as free play areas, ball courts and meeting grounds. The largest contains a full sized netball court, the other a basket court with nets. The hall is an important part of our school, from school discos to assemblies, to graduation and gymnastics, school productions to dancing. The hall can be hired for private use outside of school hours: please enquire at the school office for information and hire conditions. Whenuapai School offers a wealth of playground opportunities. Two purpose built play grounds, one for the junior school and another for the seniors. A very popular morning tea and lunchtime activity, both playgrounds have a variety of fun and challenging tasks.